No matter where you live, your garden will benefit year-round from properly applied mulch: a layer of organic or inorganic material spread evenly on the surface of the soil. Today's gardeners have a wide variety of mulches from which to choose, but deciding which type to use takes a little research. A carefully-designed landscape or flower bed instantly becomes a pièce de résistance by the simple application of decorative mulch. The varying shades and textures of a multitude of materials can be artistically contrasted with the shapes and colors in the garden. One's imagination is the only limit. But mulch has greater benefits for your landscape, two of which have great importance: conservation of moisture in the soil, and stabilization of soil temperature. Mulch falls into two categories: organic or inorganic. Organic mulches are made up of plant or animal materials that break down over time. Inorganic mulches are composed of natural or artificial materials that either do not decompose, or decompose slowly. Organic mulch increases the aeration of soil (especially clay) and increases the water retention capacity of sandy loam. Additionally, an organic mulch will improve and stabilize the soil structure to reduce the impact of rainwater, compaction from people walking on it, and increase ease of cultivation. While not a substitute for fertilizer, organic mulch does release some major and minor mineral elements that are important to growth. 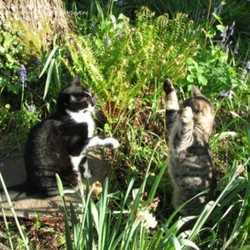 And lastly, the acidity or alkalinity (pH) of soil can be changed through the use of organic mulch. Cost, longevity, and appearance play important roles in choosing mulch. For a small garden plot or flowerbed, cost is probably not an issue; however, when considering mulching large areas, determine the priority of the three criteria. Since organic mulches break down, cost and longevity would be a major consideration in a large area. Mulches that decompose slowly also improve the soil slowly, but do not need replacement as often. For poor soil, the best choice would be a mulch with a shorter longevity to improve the soil more quickly. Large areas that simply require coverage for water retention and weed control can be spread with less expensive general mulch rather than decorative materials (pine nuggets, dyed mulches, etc.). The following list of mulches and their features is taken from The Ohio State University Extension FactSheet HYG-1084-00 "Mulches for the Landscape," and HYG-1083-96 "Mulching Landscape Plants." Buckwheat hulls: long lasting; good weed control, but material may sprout; high cost; blows around in wind. It is important to understand that "bargain" mulches can often bring you a lot of grief. Weed seeds and fungi thrive in what can only be termed "the perfect incubator". Thistle (Cirsium spp.) and Mugwort (Artemisia princeps) are two tenacious invasive weeds that have almost frightening adaptive powers, and are often lurking in bulk mulch. Once you've imported these species into your garden, you'll battle them for a long time. Nuisance and detrimental molds and fungi are often found in mulches that have the perfect combination of temperature, pH, and moisture content. Shotgun or artillery fungus (Sphaerobolus) may cause serious problems in the garden. This organism grows tiny "cups" that are filled with spores resembling tiny black eggs. The fungus shoots these spores into the air and wherever they land, they stick and produce black spots that stain siding, furniture, plant leaves, and anything else they touch. Slime molds also show up in mulch, appearing as slimy masses of yellow or orange; they can produce toad stools, some of which are toxic to humans. In mulch that has been applied too deep (3 to 6+ inches), the underlying layers undergo high temperature decomposition during the summer. The mulch dries out to less than 34% moisture and, thus, becomes a dusty mass that invites fungi to settle in. The mulch becomes moldy and hard, and water runs off, causing drought beneath the mulched area. 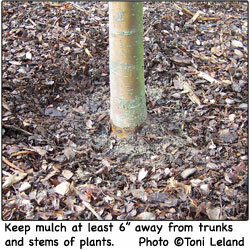 Mulch prepared from trees that were killed by disease may often be colonized by pathogens such as Vericillium dahliae, a fungus that causes wilts and death of many shade trees and ornamental shrubs. Rhizoctonia solani causes damping-off of seedling plants and is stimulated by fresh mulch, utilizing the wood cellulose as food. 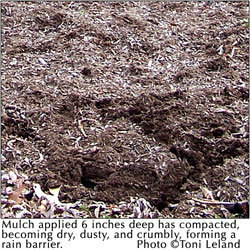 According to Harry A. J. Hoitink in "Control of Nuisance and Detrimental Molds (Fungi) in Mulches and Composts" (Ohio State University Extension FactSheet HYG-3304-98), "The best control strategy for homeowners and landscapers is to purchase composted products low in wood content." The recommended depth for most mulches is 2 to 2-1/2 inches; this application will address the primary objectives of weed control, water retention, and temperature stabilization. 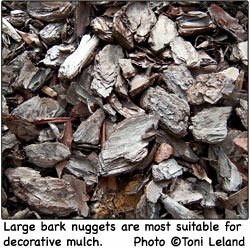 Mulches with large pieces, such as giant nuggets, will not cover as much area, due to their bulk. These mulch products are more suitable for decorative use, and should be used in conjunction with underlying landscape fabric. 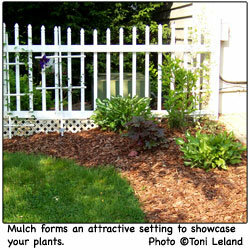 The biggest mistake most homeowners make is applying mulch anywhere from 3 to 6 inches or more. This practice can lead to serious conditions for many landscape plants. A heavy layer of mulch drastically reduces the soil's ability to dry out, leading to soggy, water-logged soil around the roots of plants and shrubs. This condition is extremely damaging to azaleas, rhododendrons, most conifers, all taxus or yew, and many perennials. Mulch piled up against a stem or trunk results in constantly wet bark--perfect conditions for disease development. Additionally, rodents may nest in this thick mulch and, during winter months when food is scarce, will feed on the softened wood. 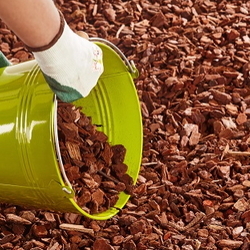 Purchasing the correct amount of mulch for your situation will save you time and money. Garden centers stock mulch in bags containing enough material to cover 2 cubic feet or 3 cubic feet. To determine what coverage you'll need, multiply the width of your space by the length; this will give you the number of square feet to be covered. If you buy bulk, you'll need know that 1 cubic yard covers 162 square feet at a 2-inch depth. A small pickup will probably hold 1.5 cubic yards (coverage for 243 sq. ft.); a full-size pickup will hold at least 2.5 cubic yards (coverage for 405 sq. ft.). 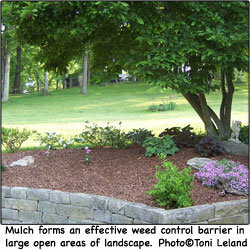 Depending on where you live, when you spread the mulch determines the benefits. When the soil has warmed and begun to dry, it's time to plan how much you'll need. 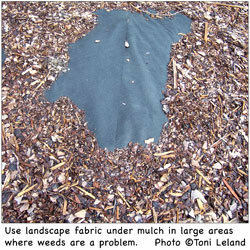 Don't mulch too early or the material will keep the soil from drying out. Plants begin root growth as sufficient oxygen becomes available and the soil temperature warms reasonably in the root area. If you live in a region where the temperatures stay cold, or the rainfall is heavy in early spring, put off mulching until May or June. In areas where winter comes long and hard, apply a second application of mulch in the autumn, especially on new plants with shallow roots: shrubs and evergreens, herbaceous perennials, or strawberries. Water established plants thoroughly in late fall, then apply mulch. To reduce heaving on new or small plants, apply mulch immediately following the first hint of frost on the ground. 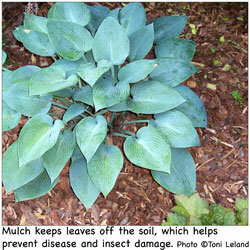 Mulch can be your best helper in the garden if you use the right material and follow accepted guidelines for use. 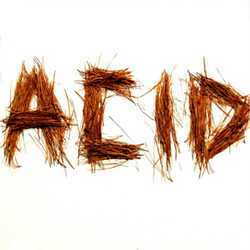 6 Reasons To Mulch Your Garden This Fall Mulching Basics Pine Needle Acidity: Myth or reality?